At times, the most challenging part of traveling is selecting your wardrobe. Clothes that will not only travel well, but arrive at your destination wrinkle-free and as ready as you are. Details Direct customers love to travel, and we’ve discovered the perfect brand to fit their jet-setting lifestyle: Sympli The Best women’s wear! Sympli offers versatile styles that not only wear incredibly, but travel flawlessly. Imagine arriving at your destination without a wrinkle in sight or never having to use the hotel iron again! Sympli women’s clothing offers a wide array of silhouettes and even come in plus sizes. The various pieces mix and match together allowing you to inevitably pack less on your trip. The Sympli Skess Even Hem Skirt goes from a professional skirt by day to a little black dress by night. Keeping you looking ready-for-anything while keeping your suitcase load light. The most versatile piece of any wardrobe is the basic black pant. 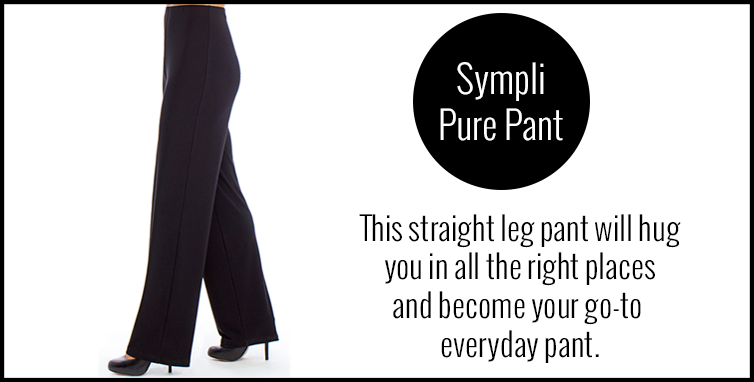 Whether you're trying to look professional at a day of meetings or sitting through conferences, the Sympli Pure Pant is the perfect fit. Not only do they pants hug you in all the right places, but the wrinkle-free fabric will keep you looking fresh all day long. Plus, when the day is done, match the pants with a fun top and you have an evening look perfect for any occassion. The Sympli Mini Skirt is an ideal piece for any wardrobe - especially for the jet-setter. This transitional skirt works for all areas of travel. Take it on a business trip and layer with leggings for a fun, yet professional look. Bring it to the beach and use it as a cute cover-up or throw a fun top over it for a night out. There is no end to the possibilities of the Sympli Mini Skirt and your travel wardrobe. For a versatile staple piece, this skirt fits the bill. Fall fashion was on display this past Tuesday evening as Details held its first fashion show of the Fall season. 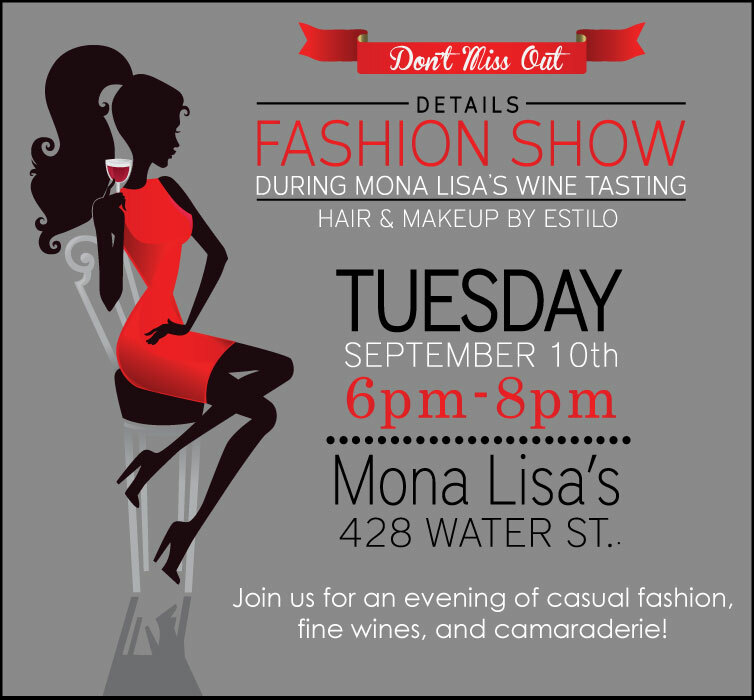 The show took place at Mona Lisa's restuarant and saw tables full of fashion followers prepped to see the newest collections. The show started with designs from Alembika, a new Israeli line from Tel Aviv featuring an artsy mix of fabrics and textures. Click the 'Read More' button below to see all the other must-have fall looks! MZ Wallace bags are one of the most popular brands in the U.S.A. These practical bags are perfect for travel with just the right amount of secure zippered pockets. Great for your busy lifestyle, be sure to store your phone and other valuables in the same pocket and you will always know where it is! Made of teflon coated nylon, these bags are both lightweight and easy to clean. Woman of all ages love these bags. MZ Wallace bags were voted the number one travel bag by the Economist Magazine. Build your wardrobe of classic essentials and exquisite pieces from the Joseph Ribkoff Fall 2013 Collection. Ribkoff is known for his timeless styling, year round, easy-care and travel friendly weighted fabrics, and superior fit in sizes 2-18. Joseph Ribkoff’s clothing responds to the multi-dimensional needs of today’s woman while providing her both quality and comfort. Joseph Ribkoff has rapidly become one of the most popular French-Canadian designers in North America. His collection is even worn exclusively by Miss America 2013 Mallory Hagan. The Fall 2013 collection features faux leather and hardware detailing, lattice sleeves, and giant hounds-tooth prints. The color palette is of deep jewel tones with sapphire, ruby, and amethyst at the center of the upcoming collection. Rich chocolate brown is introduced as a new Fall basic. Twice a year, Details hosts a Joseph Ribkoff Trunk Show, displaying the latest collection from the esteemed Montreal based design house. 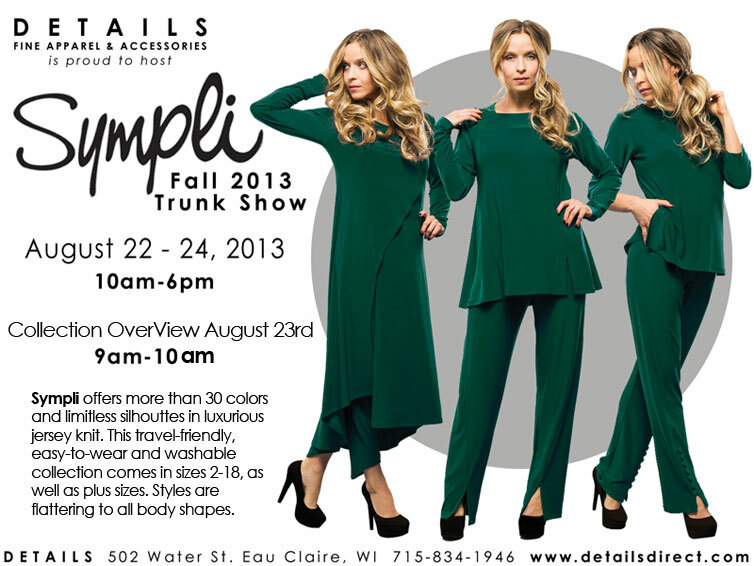 The Fall 2013 Trunk Show will be held July 26th, 10am – 6pm and July 27th, 10am – 4pm. Two days only! The new collection is arriving daily so there will be lots of new merchandise to purchase for immediate gratification, as well as an opportunity to order unique styles. A VIP Event hosted by Linda Foudala, the Midwest Regional Manager of Joseph Ribkoff, will present an overview of the collection Friday, July 26th from 9am – 10am. This is an exclusive opportunity to view the newest collection before it is available to the public. Details is located at 502 Water St. Eau Claire, WI. If you are interested in attending the VIP Event please contact Details at 715.834.1946 to reserve your spot. This one hour presentation is a good way to see the collection in its entirety before your friends have it in the dressing room and you do not get to see it. Join the fun at the Joseph Ribkoff presentation Trunk Show. Sympli was born out of Jan Stimpson’s philosophy that when we are comfortable with ourselves, we can accomplish anything. Life is cool, this is Desigual’s motto and a perfect reflection of the brand itself. Fun, unconventional, out of the ordinary, Desigual is here to bring a much needed dose of fun into your everyday wardrobe.